The Jerusalem Nazarenes of predominately Hellenistic leaning had fled north-west to Antioch, where the Legate of Syria had his central command center in Damascus in 36 CE. 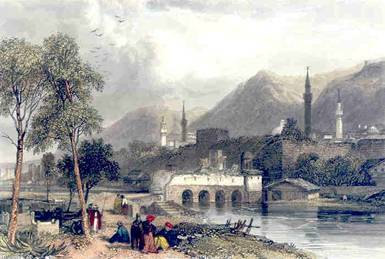 Shaul in the meantime went north-east to Damascus to track the Jerusalem Nazarenes of the Zadok-Essene leaning who were fleeing to the region of Pella, the region of refuge in the days of the Hassidim. (150 BCE) Even so foreboding cloud were again arising from Rome. 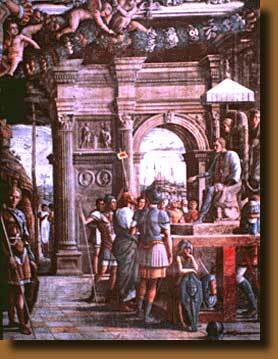 The new incoming Roman legate, Petronius, who succeeded Vitellius in 39 CE, came with orders to have a statue of Gaius Caligula Caesar made and transport it to Jerusalem to be placed in the Temple of Herod. The Jewish representatives were notified at a delegation meeting at Ptolemais of the statue preparation, with the inaugural presentation in the spring of 41 CE which also was a Sabbatical Passover. The reaction was swift and instantaneous throughout all Judah. Such a threat to the Jewish people had not been made since Antiochus Epiphanes, known as the ‘manifest God’, had an altar of Zeus Olympios erected in the Temple which caused the Maccabean revolt. Once again, Daniel’s dire prophetic description of the “Abomination of Desolation” was becoming a present and ominous reality. The reality was clear. Using force to put the statue in the Temple could only be accomplished by wholesale slaughter of the Jewish people. The Essenes, the Pharisees, the Nazarenes, the Zealots, the Sicarii, were in Stage One revolt mode. Even the Sadducees clearly saw the threat to their lives and fortunes. Yet on January 24, 41 CE, Gaius Caligula was assassinated in Rome. Word reached the court of the Legate in Antioch of Gaius’ death, before the dispatched letter of Gaius was received for Petronius to commit suicide. Judea, just prior to the Sabbatical Passover, was in prayful elation. The Providence of God seemed to put his hand especially over the Jews. Suddenly there came a revival amongst the Gentiles as they noted the providence of the God for the Jews. At this same time, Antioch, where the news first was released to the Jewish population, the Jewish Nazarenes received a great influx of new worshippers. A message was sent to Jerusalem for help and Barnabus was sent to study the situation and send a report. There was a sudden need for a teacher who understood the Greek and Roman mind of intellectual stature to guide the teach the new believers. Quickly, Barnabus went to Tarsus and recruited Saul to come and help in this emerging ministry. For one year (41-42 AD) they worked together, and during this time the name, Christiani, a word in the lexicon of Gratin (Greek and Latin) to name the Gentile followers of Jesus. Enter now the story of Peter, meeting and baptizing Cornelius in Caesarea, known as ‘a centurion of the cohort known as Italica, pious and God-fearing with all his family, one who gave a great deal in charity tot he people and looked continually to God” (Acts 2) Here enters the conflict between Paul and the Nazarenes as to whether a Gentile who became a God-believer and accepted the messiahship of Jesus, could also become a ‘Israelite’ without embracing the complete tenets of Judaism. This was the second Sabbatical Passover since the death and resurrection of Jesus. The events were rapidly unfolding in the lives of the followers of Jesus. This was a season of euphoria. Persecution, trials and acts of providence had beset not only the Jewish messianic followers of Jesus but the Jewish people as a whole. Every life was at stake. The episode of the Gaius statue brought stark realities to Jews and the Jewish Nazarenes. All were affected. To the Jewish hierarchy, a warning had been sounded. Rome could not be trusted. To the followers of the Fourth Philosophy, the apocalyptic signs of the times depicted rapid moving events when Jesus would return for his followers. The radical fringe moved in to high gear. The call went out that the “End of Time’ was at hand and the empire became inflamed with subversive activities among the disaffected and underground financing for weapons and guerrilla war supplies similar to the Irish Republican Army went into effect. This Passover was to be a pivotal period in the Nazorean faith. As expected, all available apostles were called to Jerusalem for this momentous occasion. Within the city of Jerusalem, the Hebrew Nazarene Ecclesia of Israel was making its first preparation for the return apostles from the diaspora. The Sabbatical Passovers were always a major events with millions of pilgrims coming from all over the world. Here in the city, James the Just, the leader of the Nazarene congregation was constantly praying for the safe travel of all his friends and brethren. As the Nasi or the high priest of the Nazarenes, he would be officiating at the Supreme Council of the Elders and the Apostles. The Apostle John, the Sagan of the Nazarene was the deputy to James (Jacob) the Just. The Apostle Simon Peter as the Ab-Beth Din or the general supervisor of all the ministries was busy in all the preparations. Also still residing in Jerusalem were the Apostle Andrew, the brother to Peter, Judas of James, the brother and disciples of James and Jesus was his brother’s helper. The Apostle Matthew Levi, the attorney for the Nazarene and the political liaisons to the Sadducee party. Simon Zealotes still had not left the city and remained a good contact with various factions of the Zealots and the Apostle Matthias who was selected by lots to fill the apostleship of Judas the Sicarii was also here. From the diaspora the Apostle James the Greater, the brother to John was returning after six to seven years in his ministry in the country of Spain. 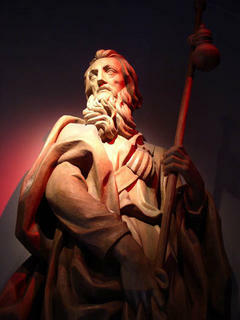 The Apostle Joseph of Arimathea returned from Avalon on the Isles of Britannia with his stories of the rapid acceptance of the message of Jesus to the Druidic high priests and the royal household of Argaviras of the royal family of the tribe of Siluria in Wales. Joseph was to set up residence with the Apostle Philip the evangelist in the port city of Caesarea. During this homecoming, the Apostle Bartholomew returned to Jerusalem from the Imperial city of Rome bringing with him the British convert from Rome, Clements to meet the other apostles and especially Simon Peter. In his book, Recognitions of Clements, he details meeting Philip the evangelist, Joseph and the Bethany family prior to 36 CE. Two decades later, Clements would be anointed as the third bishop of the ecclesia in Rome by the Apostle Peter. And then we find the Pharisee Shaul returning from a three year spiritual retreat in the Nabotaean region of the Arabian desert, a former enemy of the Nazarenes and soon to be one their greatest evangelists. Apostle James the Greater returns for the first time after 7 years from his mission to Spain. Herod Agrippa, grandson of Herod the Great, was tetrarch over Galilee. Newly proclaimed King of Judea, Samaria and Caesarea in 41 AD by Tiberius Claudius Caesar, he was wary of Jewish aspirations to overthrow the Roman rule. As a Herodian, he was looked upon by the Nazarenes as a usurper to the throne of David, and a known ‘friend of Caesar’ Yet he was scrupulous in the observance of the Jewish faith, and known for his piety, so was able to gain the support of the Sadducees and many Pharisees. What was the evidence for the mission of James the brother of John to the peninsula of Spain on the southern Mediterranean coast of Europe? Traditions stemming from at least 400 CE depicting the death of James were contained in the records of the old Spanish offices from the 7th to 9th century. Isidorus Hispalensis in the 600’s CE (vii, 390,392 and c. 183 in Jowett, George F. The Drama of the Lost Disciples, Covenant Pub., Co, 8 Blades Court, Deodar Road, London SW15 2NU, 1961, 1993, 58) wrote that the body of James the Greater was buried in Marmarica or Achaia. St. Julian, leader of the ecclesia of Toledo in the 7th century agreed with Isidorus. (Acta Sanctorum v. 33, p. 86 in Jowett 58) Freculphus in 850 CE - (bk, ii, cap. 4 in Jowett 58) also confirmed the tradition of the Spanish mission of James the Greater. The Acta Sanctorum that was written by the Bollandists was in favor of the Spanish mission of James, the brother of John. It was Theodosium, Bishop of Tira in 820 CE, who claimed that the reputed body of the Apostle James was found at the site of present famous cathedral of Santiago de Compostela in the northwest corner of Spain. There a shrine was erected and became on of the most famous site for the medieval pilgrimages of Europe. The reputed relics of James can be observed just below the high altar. The present cathedral was built 899 CE yet was destroyed by the Moor El Mansui in 997 CE, and then was later rebuilt in 1078 CE. 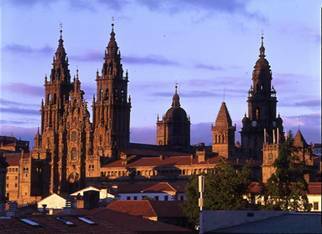 At the site of the cathedral, Santiago de Compostela, the historians of the ancient Israelites claim was the site that their descendants settled in the Spanish province called Brigantes. According to E. Raymond Capt. in Jacob’s Pillar, the descendants of Zarah, one of the twins, Zarah and Pharez, from the union of Tamar and Judah, left the main body of the Israelites as they were fleeing from Egypt after the plagues through the Red Sea. These fleeing proto-Israelites became known as the Milesians or the Gadelians, names after the fames Scythian prince, Milesius, who was a mercenary in the Pharaoh’s army and befriended Moses prior to the Exodus. The colonists along the northwestern coast of Spain were known to be descendants of part of the former Egyptian slaves. Some of these proto-Israelites traveled up the Ebro River to an area called Zaragozza (named after Zarah) along to descendants of the tribes of Dan (a seafaring tribe) and Simeon, colonized the eastern coast of Spain around Marseilles and on the Atlantic coast, the Danite colony of Lisboa, Portugal. According to the biblical story in the Torah, the son of Israel (Jacob), Judah, married Tamar and from them were born the twins, Zarah and Pharez. The Hebrew story depicts the uncertain role of who was to be the first- born son. According to the story Zarah was the first to reach his hand out of the womb and a scarlet thread was tied to it by the midwife. Yet Pharez moved ahead of Zarah in utero and was officially born as the first born. To the Israelites, though, which lineage would Jesus officially be born was not known. The Judah - Pharez lineage became the official lines of Judaites and the official royal lineage of David, King of Israel and also Jesus’ lineage according to Matthew and Luke through his father Joseph. The Judah - Zarah Lineage officially became untraceable in TaNaKh for Achan along with his family were destroyed after the destruction of Jericho for disobeying the word of the Lord. Achan was of the Judah-Zarah lineage. (Joshua 7:1-25) There is no other mention in Hebrew scripture made of this lineage. King Solomon later sent Adoniram, as a state official to collect taxes from these colonies in recognition of their Israelite heritage. While ministering there to the Spanish Israelites, it can be assumed that James the brother of John was in contact with the “4000” Israelite captives at Sardinia and the also the known descendants of the ancient Zarah descendants. After seven years, the Apostle James later returned from Spanish province to the second Sabbatical Passover in Jerusalem after the first Sabbatical Passover death of Jesus in 34 BCE. Noting the severity of the actions against James, that beheading was especially done for political crimes against the state, the rest of the apostles were suddenly in fear for their lives for now their preaching was now being perceived as political actions against the Caesar. James the brother of John became the first apostle to die “The Way” and the cause of his cousin, Yeshua, as establishing the kingdom of God on this earth. Yet King Agrippa’s grip over the Nazarene ecclesia was not over. The Apostle Peter was next. He was apprehended and imprisoned, quartered between four posted guards, two of which were manacled directly with the apostle. Each four soldiers were changed every three hours. Luke states, that Peter was jailed because it pleased the Jews, yet what was left out, it pleased only the Jewish hierarchy. What made Peter such a dangerous man? Our knowledge today suggests that a majority of the population was on the side of the Apostle Peter and would have been agitated and angry. The fiery Pentecostal preacher whose words melted the consciousness of the Jewish population and thousands were convicted and baptized, would be imprisoned on the eve of the first Sabbatical Passover celebration of Jesus’ death and resurrection. 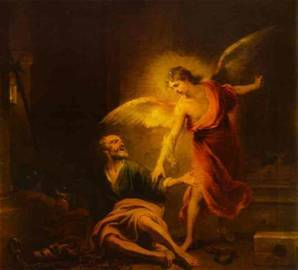 Once again, the night before his trial, white clothed ‘angels’ were sent to rescue Peter. Once again, to the Jewish hierarchy, the efficient Jewish underground was at work. While the Nazorean leadership was non-militant, the Nazorean message had many sympathizers with the Zealots and members of the Fourth Philosophy, many capable of daring rescue operations. To the Jewish hierarchy it not only depicted a security breach within their security teams, but also suggested to King Agrippa that the king himself was not secure and that an organized conspiracy was potentially in the making. The guards were interrogated and then killed and King Agrippa quickly left Jerusalem to the greater secured palace in Caesarea. Peter quickly notifies his friends staying in the home of Mary, mother of John surnamed Mark. There he dispatches a message to ‘Give to Jacob and the brothers the news’ and then Peter escapes out of town. (Acts 12:6-17) Our next record of Peter is in Rome, visiting the Roman Senator Pudens, father-in-law to the Apostle Paul in his palatial estate in Viminal Hills in 44 CE. It would be assumed allowing travel time and other events in the life of Peter, a 43 CE date for the imprisonment of Peter would be reasonable. (1) With James the brother of Jesus immediately exiting the Jerusalem scene in 33-34 CE, his vacancy as one of the three closest companions of Jesus was easily filled by James the Just without any political or loyalty repercussions. (2) If the Apostle John had close ties to the priestly families, than his brother James was equally as prominent in the loyalty of many of the disaffected priests who followed cause of Jesus. James’ return as a potential political agitator (remember the affect of John the Baptist on Herod Antipas), could best be seen as a threat to the stability of the throne of Herod Agrippa I. The attempt to kill the Apostle Peter and the death of James the Greater, sent a direct message to all the Apostles. The hand-off policy to the Nazorean leadership was gone. The death of any Apostle could be expected. Precautionary methods had be made and immediately. Herod Agrippa I was the last of the Jewish kings who with his Roman connections was able to unite the provinces of Judea. Born in 11 BCE, he was the son of Aristobulus, the grandson of Herod the Great. Named after Caesar Augustus’ friend and confidant, Marcus Vipsanius Agrippa, Herod Agrippa life was spared when Herod the Great, in one of his moments of dynastic paranoia, had his father Aristobulus, Herodian heir to the throne by Herod the Great and Hasmonean heir to the throne through his mother, Mariamme, executed by strangling in 7 BCE. At the age of three he was sent to Rome and was educated with the princes of the Roman ruling dynastic family, the Julio-Claudians. His best of friends included the mad emperor, Caligula (37-41 CE) and Caligula’s successor, Claudius Caesar (41-54 CE) of Rome. Herod Agrippa’s life was one of the Roman-Hellenistic elite. Though of Jewish Hasmonean blood, his fame and fortunes were always tied to his friendship with the Roman princes and his fate was tied closely with their dynastic royal accession fate. 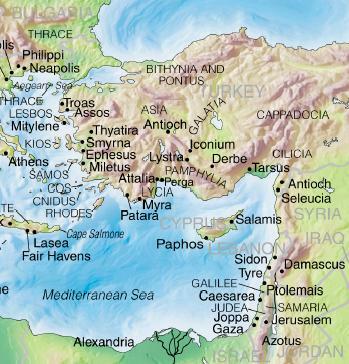 Married to Cyprus, a distant relative, his family quickly grew to include: Drusus (who died in his youth), Agrippa, Bernice, Mariamme and Drusilla. During the last years of Tiberius Caesars reign then the aging emperor was ruling from the palace on the Isle of Capri, Herod Agrippa was newly returned to the Roman political scene in 35 CE after he fled Rome and his Roman creditors in bankruptcy near the time of Yahshua’s death in 30 CE. When he urged his friend, Caligula, to seize the power of Rome from Tiberius, the Caesar’s intelligence found out and he was imprisoned. With the death of Tiberius on March 16, 27 CE, Agrippa was restored to royal favor and habited the courts of the newly crowned emperor, Gaius Caligula. Just prior to his death, Tiberius ordered that the Herodian realms of Agrippa would be incorporated into the Roman province of Syria, yet with the winds of fate or providence, Caligula restored these principalities and nominated his friend, Herod Agrippa to be its new king. The first king of the Jews in almost forty years since his grandfather, Herod the Great, Herod Agrippa was not eager to claim his possessions. Arriving in the summer of 38 CE, the first political challenge was to restore Roman law and order and reclaim the countryside from the Jewish Zealot bandits and Sicarii, and to defend the challenge to his rulership by his uncle, Herod Antipas who tried to steal the royal title given to Agrippa. Again with the intervention of his friend, Caligula, the emperor of Rome, Herod Antipas was exiled to Gaul and Galilee and Perea were annexed into Agrippa’s realm. It was assumed that the long arm of the intelligence services under Agrippa soon caught up with James the brother of John after the festival Sabbatical Year from the fall, 40 to the fall, 41 CE. The next two years saw swift retribution with Roman justice under Jewish authority against the Hebrew Nazarenes by first; the beheading of James the Greater and then followed by the capture and sudden release of the Apostle Peter. The escape of Peter was not done by any act of mercy, but did suggest to King Agrippa that his own security services had been breeched. The fingers of the House of Ananus who controlled the high priest office of the temple of Jerusalem were written all over this swift act of punitive justice. Yet Agrippa did not know Quickly returned back to his palace in Caesarea, he stayed there in a secure area. The parallel geo-political events continued to rivet the Roman and Jewish life. With Jewish population increasing significantly and seeking ways to control their presence in the city, it was soon after his inauguration that Claudius Caesar brought legislation before the Senate forbidding the Jews to assemble in the city of Rome. The implications of this degree swept throughout the Roman Empire. As we shall see later in the rise of the Christian Church in the city of Rome, it had significant implications between the progressive divergence between the Roman Gentile Messianic Nazarenes, the non-Messianic Jews and the rise of the Christian-Pagan Crestiani that would in later decades take over the Roman Empire. Quickly the undercurrents of political factionalism swept across Judea. It was understood fully that Herod Agrippa did not like or approve of the message or the mission of the Nazarenes. Throughout his short reign between 41-44 CE, the fear of Roman justice was felt in every Nazarene ecclesia meeting. The forces of Satanic evil appeared to be gaining control. Yet once again, the hand of Divine Justice was felt. It was at a public gathering, according to Josephus, when King Agrippa, draped in a robed of silver, which glistened with brilliance in the morning sun, was being hailed as a ‘god’ to a ‘pagan’ audience. Suddenly King Agrippa was seized with pain and died in agony five days later. The year was 44 CE. This account was recorded in the Acts of the Apostles. The consequences of the death of King Agrippa, was that direct Roman rule was again instituted. 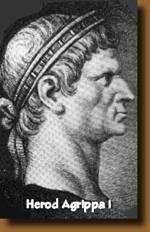 Cuspius Fadus was appointed Governor of Judea by Claudius Caesar and Cassius Longinus was appointed Legate of Syria. Also at this time, Joseph son of Camei (or Mamith) was appointed High Priest by Herod, king of Chalcis. The precautions were initiated in 43 CE after the death of James the Greater, the brother to the Apostle John and immediate action was taken. The remaining Apostles, realizing that the time was coming when the central mission of the Hebrew Nazarene Ecclesia was about over, felt it was time that their mission must now go to the uttermost parts of the world. It must still be recognized that they expected their mission to be to the ‘lost tribes of the house of Israel’. Even so, their focus was now towards an worldwide imperial outreach. According to the ancient traditions of the Hebrews, when they sought to invoke the will of the Lord, they drew lots. Even during this time, the role of the temple priest during the ceremonies was done by lots. So all the apostles drew lots in 45 CE and according to the lots drawn they were sent to a different part of the world. Simon and Matthew - cast lots for the South. Philip and Thaddaeus - were to go to the North. Matthew and James were to stay in the center of the world, Jerusalem. Peter and Paul to the kingdoms of the West. This brings us to 46 CE. The Great Famine in Judah occurred in 46 CE and a worse time could not be imagined. The Sabbatical year of 47-48 followed when all the land would lay idle according to Jewish Law. This was followed by the fourth Roman census in 48-49 CE. Three years without income, the provisions in Judah were desperate and the agitators and fomenters of rebellion of the Fourth Philosophy were active in Jewish society. Josephus talks about these hotbeds of revolt, which were actively suppressed by the new Governor, Cuspius Fadus. The message of appeal to was heard in the countries outside Jerusalem. Up in Antioch, where a large company of believers were now meeting, a Nazorean prophet, Agab predicted the famine and the believers in good humanitarian fashion sent ‘relief’ to the poor in Jerusalem, to be accompanied and secured by Barnabus and Saul. Here Saul meets with Jacob the Just and the church leaders (Galatians 2:9) and here he received his commission to become the “Apostle to the Gentiles”. With Barnabus, along with his nephew, John Mark, they begin their First Missionary Journey. The messianic church had grown and was also becoming diverse in style, outlook and in religious philosophy. Many of its adherents had never met Jesus. They were second generation Jesus followers. The central core leadership were still closely tied with the original ministry of Jesus. The fact that the blood-brother of Jesus was the central leader gave stability and credibility. As with all organizations, there were factional wings within the community. In spite of differences in ideology, the common bond between them was that they were all Jews or Jewish Proselytes. From our understanding of 1st century BCE and 1st century CE Jew, the Jewish people were use to divergence of ideology, yet their one bond with each other was that they remained true to their Jewish nationalism. Common to all these elements was the common messianic belief that Jesus did fulfill the Messianic aspirations and prophetic utterances of the Hebrew prophets. True to their Jewish heritage, the divinity of Jesus was neither affirmed or challenged, for ascribing deity to their King was yet another pagan notion. Yet the ‘Son of Man’, using Daniel’s imagery, could still be claimed to have been predesignated by the Almighty before the creation of the universe. He was revealed to the righteous and the elect since the beginning of mankind. Some of the more esoteric, spoke of the Light-Adam, the spiritual man in the sky, or the Primordial Adam in whose likeness, Adam, the earthling, was created. As their eschatology developed, the foundation found within the traditions of the Essenes, Jesus eventually became the King of Kings and Lord of Lords. On the sociological side, there were those, who had more Pharisaic tendencies, that personal purity was the most important elements in bringing the culmination of the End of Time. They were willing to sit and allow God to produce His will, that any political activity of their part to hasten the Last Days would potentially be counterproductive to God’s ultimate aims. On the opposite extreme, were the militants, the Zealots, who felt that the End of Time could not come without their active participation and intervention. They were to go to all the world and by concerted organized activity they would hasten the Day of the Lord. To them, this day meant the downfall of Rome and it was their faithful duty to promote that day: by acts of rebellion, by seditious literature, such as the Sibylline Oracles, by mercenary acts, by actively financing the underground in armed revolt.